Lausanne, Switzerland, August 30, 2016 - Newly-crowned Olympic champions Alison Cerutti/Bruno Oscar Schmidt of Brazil and Laura Ludwig/Kira Walkenhorst of Germany will headline the field at the $500,000 SWATCH FIVB World Tour Finals from September 13 to 18 when the international beach volleyball event will be held at Polson’s Pier in Toronto, Canada. Operated by the Beach Majors Company, the SWATCH FIVB World Tour Finals format includes both pool and elimination bracket play with the winning teams in each gender’s competition sharing the $100,000 first-place prizes. The winning purses match the largest check for victorious pairs since the start of FIVB-sanctioned play in 1987 for men and 1992 for women. Newly-crowned Olympic champions Alison Cerutti/Bruno Oscar Schmidt of Brazil and Laura Ludwig/Kira Walkenhorst of Germany will headline the field that has combined to play in 968 international events, with 72 gold medals, 172 podium placements and 344 “final fours” finishes along with 2,970 match wins (62 winning percentage) and nearly $11-million in combined career winnings. Joining Alison and Bruno, who are also the reigning 2015 FIVB world champions, in the 12-team men’s field are Rio Olympic bronze medal winners Alexander Brouwer and Robert Meeuwsen of the Netherlands, the 2013 beach volleyball world champions. The Brazilians defeated the Dutch pair in the Rio Olympic semifinals. Due to injuries, the Rio silver medal team of Daniele Lupo and Paolo Nicolai will not be competing in the Toronto competition. Ludwig and Walkenhorst, the top team on the 2015-2016 FIVB World Tour ranking list with six gold medal finishes, will be joined in the Toronto field by Rio bronze medal winners April Ross and Kerri Walsh, who defeated pre-Copacabana favourites Talita Antunes and Larissa Franca of Brazil in the 2016 “Summer” Games third-place match. The Rio bronze was the fourth Olympic medal for Walsh Jennings and the second for Ross. Walsh Jennings teamed with Misty May-Treanor to win Olympic gold at the Athens 2004, Beijing 2008 and London 2012 Summer Games. Ross and Jen Kessy dropped the London gold medal match to Walsh Jennings and May Treanor. Talita and Larissa will be in the Toronto competition and join Alison and Bruno as the defending champions for the second annual SWATCH FIVB World Tour Finals. Talita and Larissa defeated Ludwig and Walkenhorst for the $100,000 payday in October 2015 in Fort Lauderdale. Alison and Bruno topped the south Florida podium by defeating American Olympians Phil Dalhausser and Nick Lucena in the finals. Playing for Canada in the men’s competition will be Ben Saxton/Chaim Schalk and Josh Binstock/Sam Schachter. Both pairs competed in the Rio 2016 Olympic Games where Binstock and Schachter dropped a pool play match to Alison and Bruno while Saxton and Schalk participated in the “toughest” group and eventually placed ninth on Copacabana after being eliminated by Brouwer and Meeuwsen. If two men’s teams from Canada wasn’t enough, the home fans will be delighted to know that two Canadian women’s teams have been awarded a pass to Polson Pier. The first is awarded to Olympians Jamie Broder/Kristina Valjas but the second will be decided on a unique first day of competition at the Finals. Broder and Valjas, the only Canadian women’s team to capture a gold medal in a FIVB World Tour event, also competed in the Olympics where the pair finished second in their pool and finished ninth overall with a 2-2 record. Their two setbacks were to Ludwig and Walkenhorst in pool play and Bansley and Pavan in the “Sweet 16”. Also set to compete in the 2016 SWATCH FIVB World Tour Finals are Ana Gallay/Georgina Klug of Argentina and Lombardo Ontiveros/Juan Virgen of Mexico, the gold medal winners from the 2015 PanAmerican Games hosted by Canada and Toronto. Rio 2016 Olympic Games participants, Gallay/Klug and Ontiveros/Virgen are the most successful beach volleyball pairs from their countries in the women’s and men’s FIVB competition, respectively. With a maximum of two teams per country per gender in the competition, other women’s tandems in the SWATCH FIVB World Tour Finals are Chantal Laboureur/Julia Sude of Germany, Laura Giombini/Marta Menegatti of Italy, Elsa Baquerizo/Liliana Fernandez of Spain, and the Swiss pairs of Isabelle Forrer/Anouk Verge-Depre and Joana Heidrich/Nadine Zumkehr. Latvian Olympians Aleksandrs Samoilovs and Janis Smedins, the top-ranked men’s team on the 2015-2016 FIVB World Tour, will be competing in Toronto along with No. 2-ranked Dalhausser/Lucena, Adrian Carambula/Alex Ranghieri of Italy, Tri Bourne/John Hyden of the United States, and the Polish pairs of Grzegorz Fijalek/Mariusz Prudel and Piotr Kantor/Bartosz Losiak. The top eight-ranked teams from the 2015-2016 FIVB World Tour with a maximum of two per country qualify automatically for the SWATCH FIVB World Tour Finals; “wild cards” were awarded to four men’s and five women’s teams. Women’s “wild card” entrants are the three Canadian teams along with Louise Bawden/Taliqua Clancy and Heidrich/Zumkehr. Both Canadian men’s teams were presented with “wild cards” along with Alison/Bruno and Brouwer/Meeuwsen. The SWATCH Finals will be the first FIVB World Tour event in Canada since the 2011 Québec Open when Americans Todd Rogers/Phil Dalhausser and Brazilians Maria Antonelli/Talita captured the gold medals. 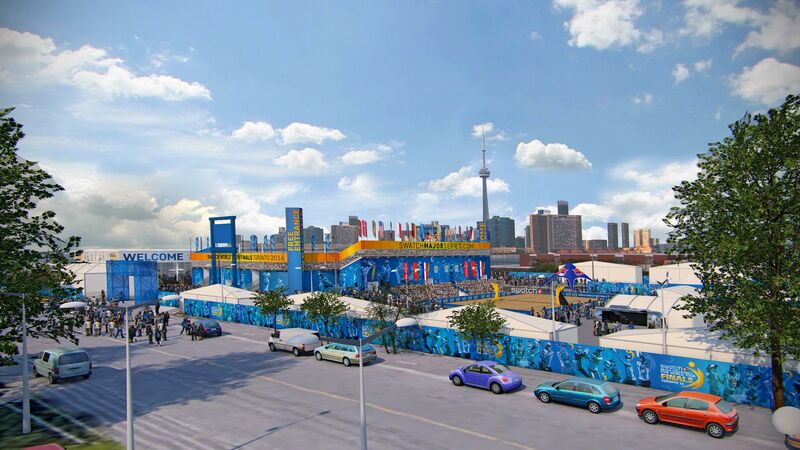 Since 1998, the FIVB has staged eight World Tour and two junior World Championships in Canada, including double gender stops in Toronto during the 1998, 1999 and 2000 seasons at Ashbridges Bay Park. *Heather Bansley and Sarah Pavan were awarded the wild card for the tournament but, following their split, they will play off against each other with their new partners in a country quota clash on September 13. The match will be Sarah Pavan/Melissa Humana-Paredes v Heather Bansley/Brandie Wilkerson.